Since it is very important to me to practice what I preach, I was inspired to write this to share a new-ish opportunity I was able to pursue – one that felt like it was hard won over many years. This story demonstrates that never giving up on something that is meaningful to you is such an important trait to embody no matter how many times you fail or feel rejected, particularly as an entrepreneur and as a person living with chronic illness. As a speaker, it is much more difficult than one might think to get compensated properly (or at all) for your time, effort, and pre/post-engagement work. 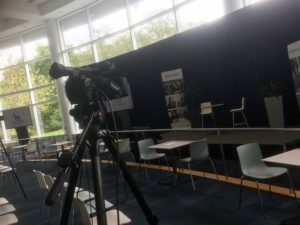 The thing about being an impactful, exciting, dynamic public speaker is that it takes a lot of time, effort, practice, and for me, money spent on various speaker-training programs over the years. The calm before the presentation. Hours and hours of going over your main points, speaking to your cats, making sure you have an attractive/exciting PowerPoint slide presentation to accompany it (the vast majority of institutions require that you have slides to go along with your presentation), tailoring each presentation to fit the outcomes the hiring party has in mind, and so much more. When I first started out with public speaking as a part of my career back in 2011, I was pleased to speak for free at a variety of different institutions such as local YMCAs, Boy’s & Girl’s Clubs, and various diabetes-related events. I was honing my craft, learning the ropes, practicing – filming myself, studying my performance, taking notes on what I could do better, etc. However, after about a year of that, I realized that speaking, teaching, and delivering the carefully crafted lessons and actionable systems that I spent so much precious time on were no longer a free service. I knew this time had come because it didn’t feel great to give away my hard-earned professional skills to companies who clearly had budgets for things like hiring speakers for events. With that feeling in mind, I began to get super clear on what I wanted – paid speaking engagements where I could interact with the audiences and have fun teaching what I love. I’ve written about manifesting in a past blog – it is a very real part of my life and my success. I wrote it in my journal (and still do), told my husband and friends that I would no longer accept invitations to speak at well-funded professional organizations without compensation, and so much more conscious and intentional mindset work. Eventually, my outreach efforts began to come around. I can’t stress enough the amount of work that goes into this on my part – researching organizations, seeing what types of events they put on each year, choosing which ones I’d actually like to be a part of, finding out who organizes the events, getting on their radar, follow up, follow up, follow up. First in April of 2018 and again last week, I had the opportunity to speak at what was once on my short list of large organizations that I wanted to hire me so that I could go in and share my perspective on life with diabetes, and on life in general regarding creating and implementing sustainable change on any level. 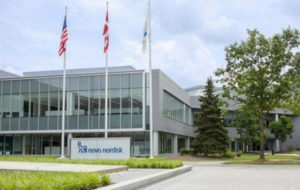 I’m profoundly grateful that the relationships I’ve been blessed to develop organically by actively participating in the diabetes community (both online and in person) guided me to stand on the stage at Unites States headquarters of Novo Nordisk less than an hour away from my house (twice this year) and share with them my thoughts on how our perspective/belief about any person, circumstance or situation always directly influences our priorities and practices around that situation, and further, how we can choose to change our perspective on anything in an instant. And, there were a couple of other people with diabetes in the audience – having members of the community nearby is always comforting! I don’t think I can say much more about it since I had to sign a confidentiality agreement, a release/waiver form, and more, but what I can say is that it was an awesome experience and one that I hope to repeat many more times in the future. 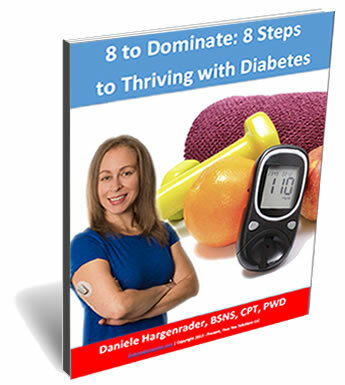 My 8 to Dominate Diabetes eBook, tips, tricks, and strategies for healthy living with diabetes and more.